I had a weird experience yesterday - I was interviewed by the local paper. I am going to be featured as the Artist of the Month at the County Office here and I am hoping that it will help to promote crazy quilting locally. I have taught in Calgary and other places but the classes I have sent proposals in for in my home county have always been cancelled due to lack of registration. So, I am thinking that if someone does not want to learn crazy quilting, it can only because they have never seen it! lol Am I right or am I right? So, it feels important to me to do what I can to promote our art form here on the local level. This was my reasoning behind having my work featured as the Artist of the Month and also for the local newspaper article. But, I have to say that being interviewed feels really weird. Luckily, it was a charming gentleman who came out to chat with me but the weirdness comes into having to promote yourself in order to promote crazy quilting. I'm sure I'm not alone in feeling this is odd - probably everyone my age was brought up with the adages of "being seen and not heard" and "modesty is a virtue". So, blowing your own horn really goes against the grain! I did it though and I hope the article with peak the interest of some local stitchers who will go and see my exhibit and then decide they want to learn all about crazy quilting. Cross your fingers! It is an annual tradition on the Crazy Quilting International group to have a Christmas Cracker Exchange. We draw names and send each other homemade Christmas crackers stuffed to the brim with all kinds of stitching stash. Unfortunately, I ran out of time and had to use plain fabric for the outside of my crackers. I had the best of intentions of covering them with pieced crazy quilt blocks but time just wasn't on my side. Hopefully the goodies inside helped make up for it though. Here is what was in the first one - yummy fabric, decoupaged buttons, charms, a butterfly applique, silk ribbon, buttons and beads. Lots of bling in this one! The second one was more on a blue theme with a blue butterfly applique and silk ribbon in shades of blue and mauve. More decoupage buttons, beads, sequins, charms, buttons, trim and a silkie. This is the last one and it was more pink in colour - same fabrics, a Christmas silkie, beads, charms, buttons and a range of pink silk ribon. I also added a cabachon face trimmed out in beads. I hope Elizabeth, Joyce and Lorrie enjoyed the additions to their stash. I just received my last cracker today from Portugal so as soon as I have a chance I will take photos and share what was in the ones I got in the mail. This is such a fun exchange every year! 1. This year I am going to continue with teaching crazy quilting that I started last year. I will make as many opportunities for myself as I can to do this. I am also going to build a workshop or class around a specific project that I'll design and submit an application to teach it wherever the opportunity presents itself. More of the same as last year - just stretching further with it. I actually did this although I had not realized it until I stopped to think about it. In order to make the cq classes more appealing for the fall session, I put together a cq Christmas stocking and built the class around it. Spring classes scheduled did not go through as hoped due to lack of registration but I have a little something planned for January to hopefully help fix that problem. (More on that later! lol) The fall classes went ahead for the most part and I really enjoyed them - such great ladies attended. It was a pleasure to get to know them. Although this goal was met technically, I still have a ways to go to complete it in the spirit I intended when I originally made it. I did manage to make some gifts and I am really pleased with the ones I made. I won't have long to wait now to see if the recipients feel the same way about them - lol! I fell short on this by a long shot but I did manage to bring Christmas shopping back under control and that was half of my goal, although unstated. I am in an absolute panic to finish projects in the next week but honestly don't know that this will get started, let alone done. So, I think I have to give this one an "F" on my report card. I think though that next year will see it done and that scheduling was the main problem I had. Something always comes up and you just have to make time for these things, even if you don't "have time". Another "F"! Didn't get it done, didn't get progress made on it even. I think I will have to rework the schedule to figure out when I want this done and how I'll do it next year. Open-ended projects just don't work for me. I need deadlines to make it work and even then I will procrastinate until the last moment. Lesson learned at last! I am drawing a complete blank here - did I even enter any? I don't think I did but I might have entered a couple small ones...? I was getting discouraged going over the last couple goals, but success at last! This one was a go. 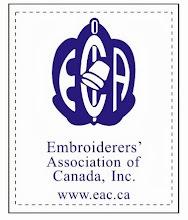 I wrote an article for Embroidery Canada and submitted it (remember they don't have to be published for my goal - just written and submitted, lol) Also did a write up on the CQI Retreat this year and it appeared in the last issue of Pat Winter's Gatherings. So, that is two! Ta-dah!! Easy-peasy! This one was very easy to keep track of and accomplish because I have done taken part in the Quilt of the Month Club at AAQI. I got my required 12 charity projects done in one fell swoop with the AAQI quilts! Can I hear a Whoop? In addition, I managed to get some donations in for a couple of silent auctions, donated some stitching books to my favourite library in the summer, and got a couple projects donated to the Hospital gift shop. There were group projects I was involved in too - Hearts & Hands for Sendai, etc. so it is all good. 8. I have decided, because I am a terrible procrastinator, that I will stitch a minimum of 15 minutes per day. Once I start I am likely to carry on longer, but starting is the difficult part for me. This was the best goal I set for myself the last couple years - I highly recommend it! Doing that 15 minutes a day keeps the creative blocks at bay and really increases my output. I just can't say enough good things about the 15 minutes a day. It has even extended to other areas of my life - 15 minutes of housework at a time, 15 minutes of organizing, or sorting, or computer work... They all add up! It is a new area for me and that is always a bit scary but nothing ventured, nothing gained. Nope - changed my mind on this and decided to take a different direction. Watch for my new and improved solo Etsy shop in the new year instead. Well, how do I judge this one? I did manage to get rid of a bunch of kits and UFOs etc. I donated some to various causes and that helped lighten the load. However, I added at least as many UFOs and kits to the stash so I don't know quite how to assess my progress here. Now, I ask you, how Canadian is this photo? lol Here we are heading off to the Kananaskis to look for a tree - through a snowstorm and with a box of Tim Horton's Timbits on the dash of the truck! We found the perfect spot and all climbed out. and the meal ready for when everyone gets back from trudging through the snowy forest finding "the perfect tree". Even the snack after the tree hunt is a big family tradition - hot dogs over the fire, chili and hot chocolate. Here is my dh, Gary, and dd, Katie - the intrepid tree hunters! It would be easier to stop at the tree lot but how can you put a price on a smile like this?! There seems to be a wildfire burning through the online community - of words! It started with a blog post, sorry I can't remember whose, about her choice of a word for 2012. Now I see almost everyone on one of the groups I belong to has chosen a word for the coming year - a word to inspire, direct, and motivate. All the words chosen seem to be thought provoking - light, do, enjoy, change, encourage... Almost every word sounds wise and deep when taken by itself. You consider the meaning, the possible nuances, and what it means to the person who has chosen it. Not one to like feeling left out, I put a little thought into it and chose my word for 2012 - journal. It may not be as deep in meaning as some of the words but I hope it will keep me on track a bit. It can't hurt, right? 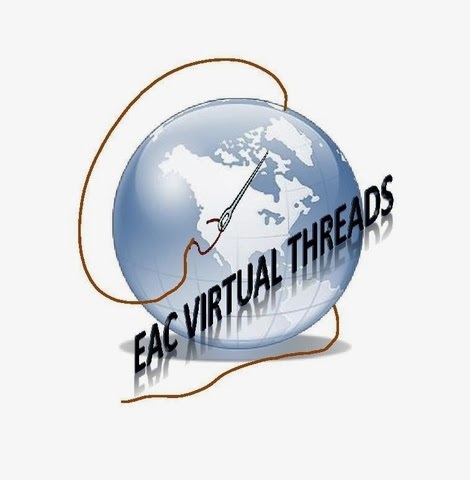 I have signed up for two big projects for 2012 - the Bead Journal Project and the Crazy Quilt Journal Project for 2012. Both of these pursuits promise a year of adventure in stitching but a lot of work. I think both will prove rewarding. I also chose journal for my word because I have been wanting to explore art journals - it seems to be so wide open for interpretation and exploration. 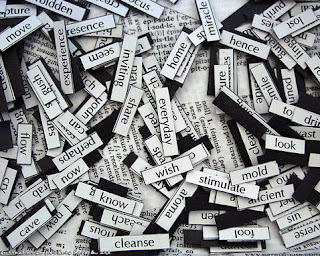 So, have you chosen a word to inspire you in 2012 yet? What is it? 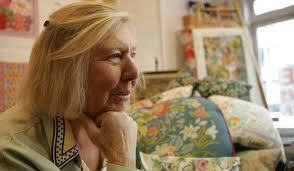 I was saddened this morning to read about the passing of needlework icon, Erica Wilson. I have several of Erica's books in my collection and it is a testimonial to her talents that I still consult these books today as I have for many many years. 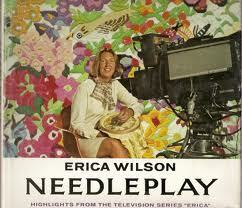 Erica Wilson led a rebirth of needlework, bringing crewel and other embroidery techniques to an international audience through books, magazine articles, and television. She passed away at the age of 83 from a massive stroke but her legacy will live on. This weekend, dd and I finally managed to see a piece of Canadian History that has been going on for thirteen years now - the Canadian Pacific Holiday Train! This year the train visited 140 communities along its route. Here you see the train pulling into Vulcan, Alberta, where we were waiting to see it. As the train reaches each destination, it stops and a boxcar stage opens up. I am not actually sure if these energetic elves were part of the show or members of the community but they managed to keep everyone very enthusiastic. As we all stood on the railway siding, performers including folk singer, Valdy, performed for the crowd. This is really going to show my age, but I remembered every word to Valdy's "Rock 'n Roll Song"! I even saw him almost forty years ago when he was the warmup act for another band! It was great to see him again and sing along. DD, Katie, and I enjoyed the event so much! As you can see, so did her dog, Dexter. And here I am! It is very rare that I actually end up in a picture so I thought I would share it as well. Usually I am the one behind the camera. Some folks have managed to see the train every time it has come through. I was pretty impressed by how prepared some folks were to watch the show in comfort - like this gentleman! Since its inception in 1999, the train more than $5.6 million and over 2.45 million pounds of food has been collected in Canada and the United States. This is just some of the food which was collected the day we were there. In addition, over $5,000.00 was received by the foodbank, which they are able to use to provide four times that amount of food - over $20,000.00 worth! In typical prairie style, there was a hayride after the event for everyone to enjoy. That a beautiful team of horses! Here is the caboose, slowing disappearing after the event. I would love the chance to see the train at night sometime since the sides were covered in Christmas light designs. 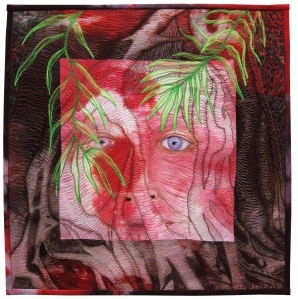 Hollis Chatelain earned a “hat trick” and the coveted MVP award for “Hollow,” a 16″ x 16″ thread-painted, machine quilted image of a woman’s face. Chatelain’s quilt raised $2,570 for the Alzheimer’s Art Quilt Initiative (AAQI) in the “Stanley Cup Quilt-Off” online auction which ended November 10th. This is the third year in a row her quilt earned top dollar in the charity auction. Twelve quilters in two teams competed for bragging rights, the highest selling quilt earning its maker the MVP award in this spirited competition between The Feed Dogs (Alex Anderson, Hollis Chatelain, John Flynn, Becky Goldsmith, Renae Haddadin, and Sue Nickels) and The Rotary Blades (Caryl Bryer Fallert, Pat Holly, Libby Lehman, Judy Mathieson, Mary Sorensen, and Ricky Tims. The annual celebrity quilt auction was the most successful online auction in AAQI history raising $14,025 for the nonprofit. A Viewer’s Choice component to the “Stanley Cup Quilt-Off” was also offered at the International Quilt Festival in Houston and online. Each $1 donation to the AAQI was counted as one vote, raising an additional $2,277.26 overall. Profits from sales of earrings made with images of each of the 12 auction quilts, brought in $1,025 for a grand total of $17,327.26. I am tempted to quote Monty Python here - "And now for something completely different...!" This is my quilt donation to AAQI for this month. I've named it "The Cathedral Walls are Falling Down". It started life as a rectangle of vintage quilting - cathedral window blocks to be exact. As soon as I found it I knew it wanted to become an AAQI quilt but it took me awhile to figure out how. I ended up deconstructing it into pieces with quite a bit of hand sewing involved. Then I reassembled the pieces into a random shape which fit the size requirements. I added buttons at all the junctions and corners. I like the idea of it portraying something as solid as a cathedral slowly falling apart. We look to our elders for guidance and wisdom but Alzheimers robs us of this privilege by making their minds crumble and fall apart like my imaginary cathedral. Hopefully someone else will see what I see in this piece. I have just finished up another Christmas gift - this time for my granddaughter. (She doesn't read my blog so it is safe to share here). The idea started with these kits I picked up at the thrift store. They were complete and the original price tag on each was $35 - I paid $4 each for them so I was off to a good start! My granddaughter does artwork on the computer, creating anime characters using the Paint program. So, the first thing I did was lay my hands on two of her pictures. The kits came with a stretched canvas and a foam brush, scraper and jar of medium. First step is to copy the pictures on a laser copier on the special paper provided, making mirror images. Next you brush a layer of the medium over the artwork and the canvas. Once this is dry, you do the same again, this time brushing in the opposite direction. Easy Peasy! After the second coat is dry, you put a generous coat of the medium on the canvas and then place the artwork copy face down onto the canvas. Use the scraper then to press the medium out from the center towards the edge of the canvas, wiping the excess off as it oozes out. You can either let it dry for a couple hours then, or if you are inpatient like me you can put it in the oven at 170 for 15 minutes. After that you moisten the back of the paper until it becomes translucent. The paper peels off easily then in one piece leaving the artwork image behind. One more coat of the medium to seal it all and it's done. Very good instructions in these kit - very easy project. So here they are, with the image applied to the stretched canvas and ready to be hung up on the wall. I think the two of them look pretty neat and will make a nice grouping on her wall and I think (or at least I hope!) that she will think it is pretty cool. So, one more handmade gift off the list! First of all, let me say right off the bat that I can't take credit for this beautiful stitching. I didn't do it - it was the cover of one of my Christmas Crackers I received in a CQI swap last year from a wonderful crazy quilting friend. I can, however, take credit for the finishing! I am always on the lookout for boxes and things I can take apart and reassemble to hold crazy quilting pieces. This box from the thrift store was a great find and I paid under $5 for it. It held a pretty ugly grouping of ceramic bits and bobs but now it holds this beautiful stitching. There was lots of depth to the original collection in there so the bullion stitch insects and other dimensional stitching have lots of room to breath. I love it when a plan comes together! I will be keeping this for myself and finally I have a wonderful way to protect the treasured gift of stitching and display it for everyone to admire. Before I get into the quilts in Houston, I need to remind everyone there are two days left on December's AAQI auction! There are still some bargains to be had so think about your Christmas shopping list. Here is a sampler but check out the rest here. And now the news from Houston! The Alzheimer’s Art Quilt Initiative (AAQI) raised $62,000 during International Quilt Festival (IQF) in Houston, Texas. From November 2-6, 2011, volunteers sold 1,141 Priority: Alzheimer’s Quilts (mini quilts measuring 9" x 12" or less) breaking all previous sales records for the all-volunteer nonprofit organization. Click here to see the quilts that sold in Houston. This was the sixth year the AAQI was invited to display and sell Priority: Alzheimer's Quilts by IQF founder and director Karey Bresenhan. Brooke and John Flynn, from Billings, Montana, again sponsored the booth. The Alzheimer's Art Quilt Initiative awarded $115,000 in grants in 2011, funding research at the University of Michigan, the University of Pittsburgh, and CornellUniversity. AAQI grants are made possible in large part from income generated by selling quilts made by its supporters. Nearly 9,000 Priority: Alzheimer's Quilts have been donated since the effort began. The Alzheimer’s Art Quilt Initiative is a national, grassroots charity whose mission is to raise awareness and fund research. Alzheimer’s Illustrated: From Heartbreak to Hope, a nationally touring exhibit of quilts about Alzheimer's, and the Priority: Alzheimer’s Quilts project are two of its programs. The AAQI has raised more than $679,000 for Alzheimer’s research since January 2006. Ami Simms of Flint, Michigan is the founder and executive director of AAQI, a 501(c)(3) nonprofit organization. Her mother had Alzheimer’s. For more information on the AAQI or to make a donation, contact Ami Simms at 810-637-5586 (9 a.m – 3 p.m. Eastern), ami@alzquilt.org or www.alzquilts.org. I was very happy to see a couple of my quilts included in the ones that sold in Houston! I hope they bring happiness to the folks who bought them! This week's Thrifty Thursday post has nothing to do with stitching at all - it is just something I came across yesterday that I could not resist! I love this colourful firescreen I found at the Salvage Center. It is sturdy, made of painted tin, and makes me smile every time I look at it. The price on the still attached tag is for $45.00 which I wouldn't consider a bad price but probably would never have paid. So when I saw it there and asked for a price and was told $10, I thought why not treat myself? I came right home and set it up in front of the woodstove and it is jumpstarting my urge to decorate for the holidays! Last Crazy Quilting Class of the Year! Last Saturday I had the pleasure of teaching a class for the Town of High River on how to make a Crazy Quilted Christmas Stocking. As you can see, Glyn looks very happy with hers! Here is Debra's stocking - the results certainly were beautiful! She was very patient with my drooling over her grandmother's button box too! If you enlarge this photo I hope you can see the motif with the ruched ribbon and the darling little brass buttons. They came from the button box and were just perfect in this spot! We held the class at The Culture Centre in High River - a wonderful facility! We had all the room we needed to spread our stash out and get right into it. This is the second time Jasmine has taken a crazy quilting class from me so it was really nice to see her again. She has a real artistic vision and takes whatever I show her and makes it her own. Sharon was another student who wasn't a stranger to me. We used to attend the High River Handicraft Guild together and I had the pleasure of having her in my Fabric Manipulation class earlier this fall. It was exciting to me to see her take the embossed velvet she made in that first class and incorporate it into her Christmas Stocking in this class. I want to thank Valerie, Jasmine, Ann, Glyn, Debra, Sharon, Rhonda and Ethel for making this class such a pleasure to teach! December AAQI Auction Starts TODAY!